W. Hacking. 83pp. Harrison House, Inc. P O Box 35035, Tulsa, Oklahoma, USA. 2002. Formerly entitled ‘SMITH WIGGLESWORTH-A LIFE ABLAZE WITH THE POWER OF GOD.’ Harrison House inc. 1995. Formerly entitled ‘SMITH WIGGLESWORTH REMEMBERED.’ Harrison House, Inc. 1981. For further information see ‘Smith Wigglesworth Remembered’ (below). Colin Whittaker. 157pp. Kingsway Publications, Eastbourne, UK. 2000. Colin Whittaker provides a collection of seven true love stories that help point the way towards the ingredients that make up a lasting marriage. 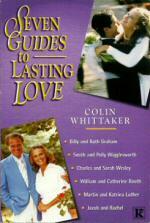 A seventeen page chapter describes the marriage of Smith and Polly Wigglesworth. Other couples featured include Charles and Sarah Wesley, William and Catherine Booth, and Billy and Ruth Graham. Colin Whittaker. 208pp. Marshall, Morgan & Scott, Basingstoke, UK. 1983. Also published in the USA by the Gospel Publishing House, Springfield, Missouri, USA. 1985. 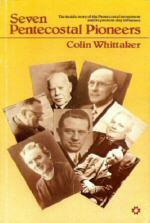 A collection of biographies on seven of the founding members of the Pentecostal Church by Colin Whittaker, a former Minister of the Assemblies of God and for twelve years the Editor of ‘Redemption Tidings.’ A twenty-eight page chapter on Smith Wigglesworth, entitled ‘Smith Wigglesworth - the Apostle of Faith’ is included. Reference is made elsewhere in the book to Alice and James Salter, Wigglesworth’s daughter and son-in-law, and Donald Gee. W.F.P. Burton. 40pp. Elim Publishing Co Ltd., Clapham Crescent, London SW4. 1949. William Burton served in missionary work in Africa with James Salter and altogether wrote 28 books. ‘Signs Following’ is a combination of bible teaching and testimonies. Included is an account of a man healed of tuberculosis through Smith Wigglesworth’s ministry, a Methodist minister who receives the gift of tongues whilst visiting the Bowland Street Mission and a report by Smith’s son Seth of a visit to a George Jeffreys meeting in Leeds in 1928. Stanley Frodsham. 158pp. Gospel Publishing House Springfield, Missouri, USA. 1948. Also published by the Assemblies of God of Great Britain and Ireland in 1949. The ‘classic’ biography on Smith Wigglesworth written by his good friend Stanley Frodsham. It is based upon information provided directly by Wigglesworth and especially by his daughter and son-in-law, Alice and James Salter, who travelled with him on many occasions. Published in the year following Wigglesworth’s home call it is still in print nearly sixty years later. Early editions were hard bound and contain some excellent photographs of the Wigglesworth family. Stanley Frodsham was editor of the ‘Pentecostal Evangel’, the official organ of the Assemblies of God (AOG), Springfield, USA, becoming in 1921 editor of all AOG publications. Donald Gee. 13 March 1964, Pg 5-6 ‘Redemption Tidings’, Nottingham, England. ‘SECRETS OF SMITH WIGGLESWORTH-PERSONAL INSIGHTS INTO THE MIRACLE LIFE OF GOD’S GENERAL.’ 2002. William Hacking. 107pp. Harrison House Inc., Tulsa, Oklahoma, USA. 1981. Formerly entitled ‘REMINISCENCES OF SMITH WIGGLESWORTH.’ 1972. William Hacking, a Pentecostal minister, provides a collection of personal reminiscences based upon his 25 years’ acquaintance with his friend Smith Wigglesworth. The book contains many insights into Wigglesworth and a collection of notes on his preaching which were made by the author whilst present at a series of Wigglesworth meetings. Michael Bower. 45pp. Flower Pentecostal Heritage Centre, Springfield, Missouri, USA. 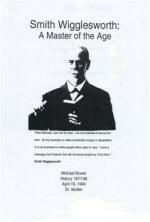 A project report examining the historical context within which Smith Wigglesworth lived and ministered. In addition, a Wigglesworth ‘meeting’, his international ministry and his legacy are discussed. Julian Wilson. 228pp. Authentic Publishing, Milton Keynes, UK. 2002. A more recent account of the life of Smith Wigglesworth which combines new and earlier published material. Of note are details of his evangelistic campaigns in Australia and New Zealand in the 1920s. In addition, a reproduction of the front page of the Daily Mirror edition on Friday 16 May 1913 showing a public baptism service conducted by Wigglesworth in the sea at Roker, Sunderland, is included. Albert Hibbert. 112pp. Harrison House Inc., Tulsa, Oklahoma. 1982. Also published by Sovereign World Ltd., Tonbridge, UK. 1987. Albert Hibbert knew Wigglesworth personally; both visiting his home and attending his meetings. Based primarily upon personal reminiscences, the author considers different aspects of Wigglesworth’s life with the aim of discovering the secret of his power with God. 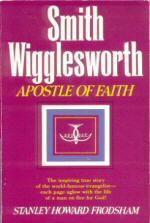 This is approached under three headings: Wiggleworth-the Man; the Spirit and Life in the Spirit. Of related interest is a 1hr 15mins recording of a talk about Wigglesworth given by Hibbert in 1972 - see Tapes & CDs. 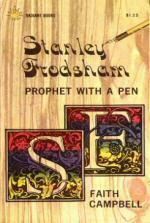 Stanley Frodsham was a good friend of Smith Wigglesworth over a period of many years. Smith conducted the marriage service of Stanley and his wife Alice, and following the couple’s move to the USA, visited them on many occasions. Furthermore, Frodsham published many of Smith’s sermons in ‘The Pentecostal Evangel’ of which he was Editor for some thirty years as well as writing his biography ‘Apostle of Faith.’ Faith Campbell, who is Frodsham’s daughter, includes a number of references to Wigglesworth in this book and it clear that she was blessed by his company. Of note is a chapter entitled ‘With Wigglesworth in California’ and also a brief account of a shopping trip arranged by Smith. Compiler not named. 192pp. Wilmington Group Publishers, Fort Lauderdale, Florida, USA. 2005. A record of the prophecy given by Smith Wigglesworth to David du Plessis in 1936 relating to the continuation of the Pentecostal movement with the Charismatic renewal which is still occurring today. Excerpts are included from books by du Plessis along with a transcript of the only remaining recording of du Plessis speaking on the prophecy. In addition, a sermon and lectures to bible students on the subject of prophecy by Wigglesworth are included.